The unique collection has had press coverage. Discover! 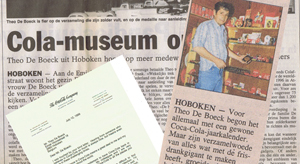 Get to know the unique Coca-Cola collection gathered by Theo de Boeck. The items from this collection have recently been put up for sale, and will gradually be added to the photo gallery. For Sale: unique Coca-Cola Collection! The many unique items from this Coca-Cola Collection are offered for sale. Become part of the rich Coca-Cola history by owning some of the memorabilia. Give yourself a piece of the Coca-Cola dream world to complete your collection or liven up your home. Also ideal as an original gift for family and friends. All items on offer are originals. This Coca-Cola collection has always been handled carefully and is extremely well conserved. Very valuable for true collectors. 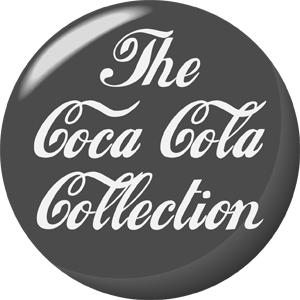 The Coca-Cola Collection: how to order? All prices of the unique items in the collection are stated in the opened photographs in the photo gallery. Do you have any questions? Please contact us. Do you want to know how to place an order? Click here. Do you want more information about any of the items from the collection? Feel free to contact us! Or fill in the contact form. We will handle your question within 24h.